New Mexico- a half-brother to Klawervlei Stud’s well performed young stallion Royal Mo, has been made eligible for this year’s Triple Crown, consisting of the Kentucky Derby, Preakness Stakes and Belmont Stakes, by the January 26th early nomination phase deadline. The regally bred Chad Brown trained three-year-old New Mexico, as yet unraced, was produced by the well bred Saint Ballado mare Royal Irish Lass. The latter is best known as the dam of the very talented former Triple Crown hopeful Royal Mo and the classy stakes winner Tara From The Cape. The former Breeders’ Cup contender Tara From The Cape was in the news in Australia this weekend when her son Lion’s Head won over 1400m at Kembla Grange on Tuesday. 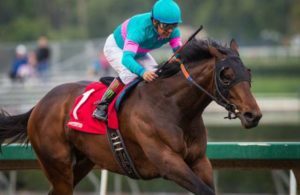 New Mexico’s half-brother Royal Mo, a son of US champion and sire sensation Uncle Mo, was one of the best of his generation at three, when he won the G3 Robert B. Lewis Stakes and ran third in the G1 Santa Anita Derby –one of the leading traditional preps for the Kentucky Derby. His sire Uncle Mo is no stranger to Triple Crown success, with Uncle Mo’s son Nyquist having won the Kentucky Derby in 2016. To date, Uncle Mo is the sire of more than 70 stakes horses including the G1 winners Outwork, Gomo, Mo Town, Unbridled Mo, and Dream Tree. Royal Mo’s eagerly awaited first foals arrive this year. id, Donec ut commodo risus. libero.